I have mentioned before that I graduated with a small group. The majority of us had been friends since we were 4 years old. We graduated just yesterday 15 years ago. We have all stayed in touch. We don't get to see each other often, but thanks to social media we have stayed in touch with each other. 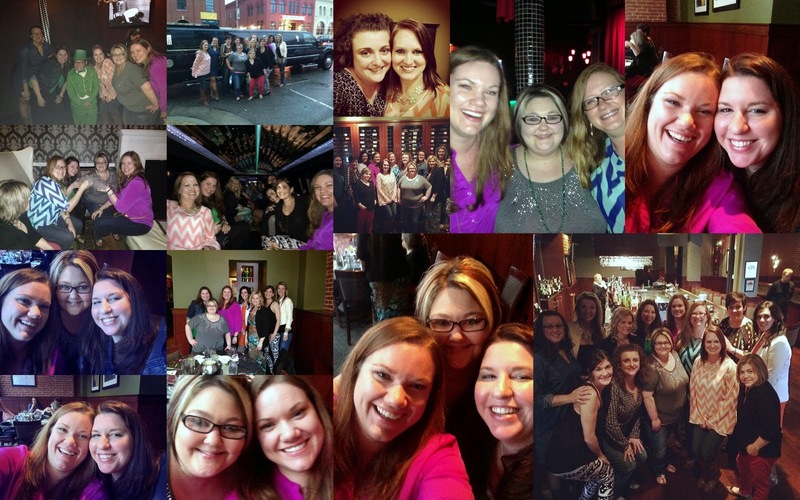 This weekend 13 of us girls had a reunion in OKC. We had a great time. We all met at our hotel Saturday afternoon. Then we went to dinner at the Melting Pot in Bricktown. Afterwards a Limo picked us up and we enjoyed all the St. Patrick's Day celebrations Bricktown had to offer. There were leprechauns, drinks with dry ice and greasy fast food. After the bars and downtown shenanigans we went took our limo back to the hotel. We stayed up wwwwaaaayyyy past my bedtime catching up on the last 15 years. We had a great time. I hadn't laughed that hard in a long time. The best thing about this group of girls is that even though we don't see each other often and life has happened in the in between times we all picked up right where we left off. That's my idea of a true and lasting friendship. I'm pretty sure that we will be 100 and still goofing off with each other. We had such a good time we are already planning our next get together a little farther south. I can't wait until the next time. Mr. Mayer handled his weekend like a champ. He even took all the kids-by himself-out for pizza Saturday night. Pretty impressive. When I got home all my people were happy to see me. I always feel like a rockstar when I come home. There is clapping, cheering and lots of hugs.